For this week’s review I was sent the Kettle-Q with the Cooking and Cleaning Kit from John and Vicki Button at Little Griddle Innovations, LLC. Little Griddle Innovations, LLC is a family-owned corporation based in Sterling Heights, Michigan. The company was formed in late 2000 by husband and wife, John and Vicki Button. 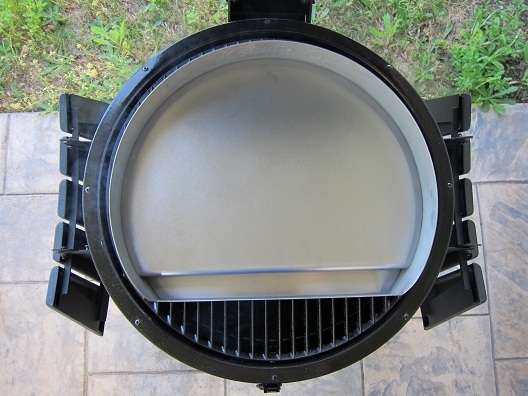 The Kettle-Q is a grill top griddle made of 14 gauge 430 grade stainless steel that can be used on kettle style grills, smokers like the Weber Smokey Mountain or Kamado grills like the Big Green Egg, Primo and Char-Griller Akorn Kamado. The underside of the Kettle-Q has vented cross bracing that prevents bending and twisting as well as providing even heat distribution. 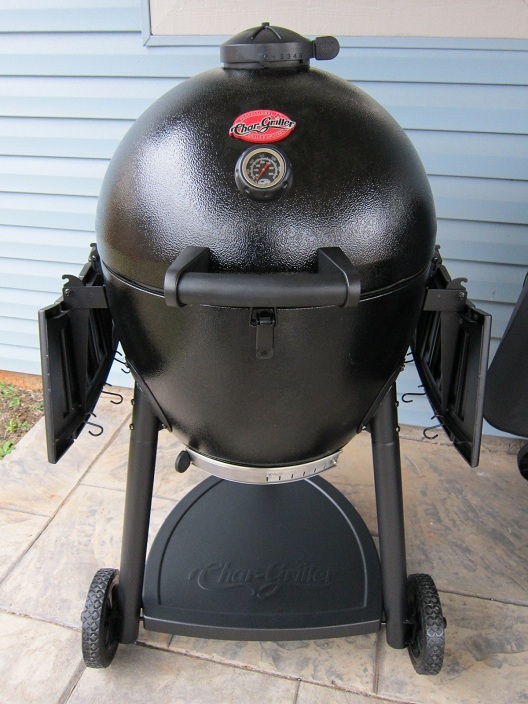 For this review I decided to use the Kettle-Q on my new Char-Griller Kamado Kooker. One of the things I really liked right away about the Kettle-Q besides the great quality and craftsmanship of the product was the 175 sq. in. cooking surface. 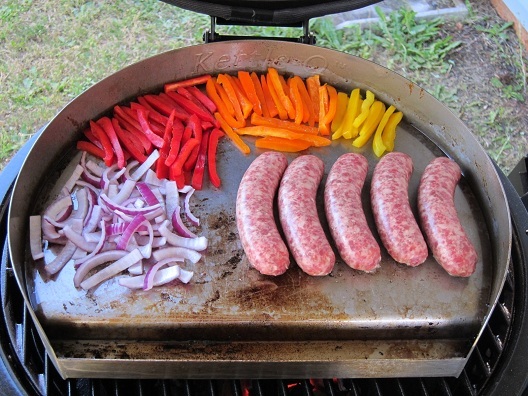 I could tell I would be able to fit a decent amount of food on this griddle. The Kettle-Q also has 2 in. 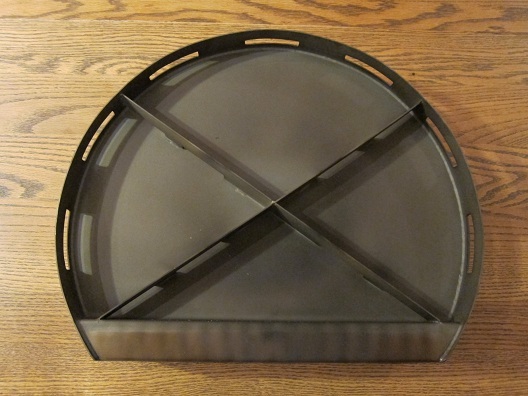 tall sidewalls that help to contain food while cooking and a 1 1/4 in. deep full grease trough that is nice and wide to help catch the grease while cooking. You also use the trough to scrape leftover debris into during the cleaning process. 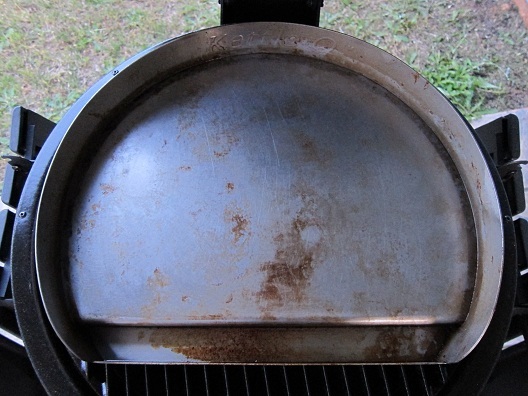 Plus having a full trough like this helps eliminate flare-ups from the grease. 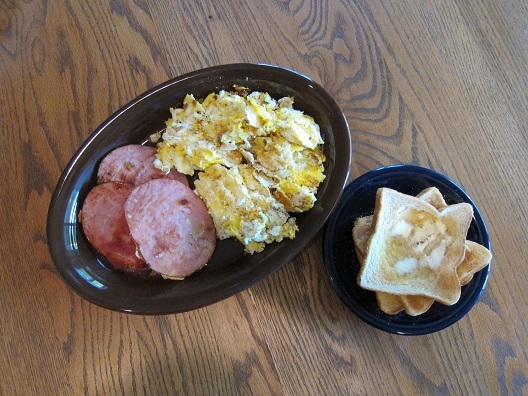 Now for my first cook on the Kettle-Q I decided to go with some ham and eggs for Easter Sunday dinner. Nothing beats breakfast for dinner. 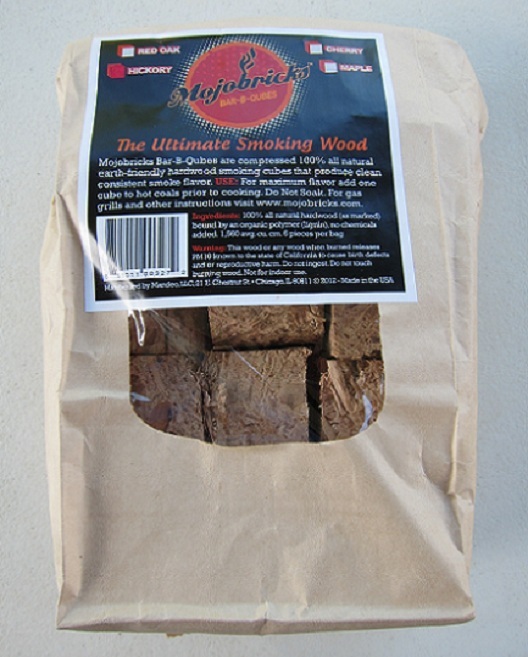 🙂 The first thing I did after I lit the lump charcoal and a couple of the new hickory Mojobricks Bar-B-Qubes was to spray some PAM Grilling Spray on the Kettle-Q and then allow it to preheat. The Kettle-Q performed like a champ and I had no real issues with the food sticking to the surface of the griddle. 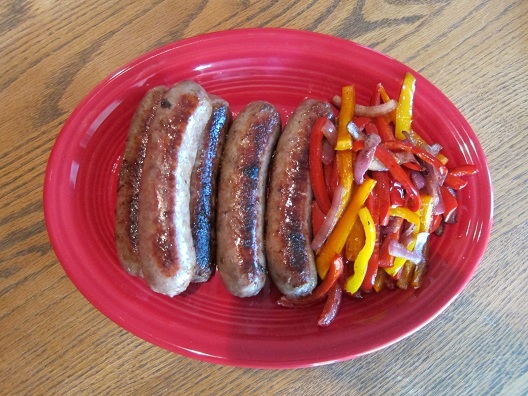 My 2nd cook on the Kettle-Q I decided on cooking some beer brats with red onion and some red, orange and yellow peppers. Cooking these foods gave me the opportunity to try out the 16 in. 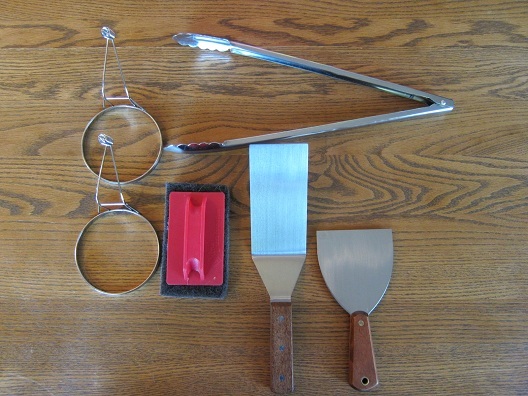 stainless steel tongs as well as the stainless steel turner. 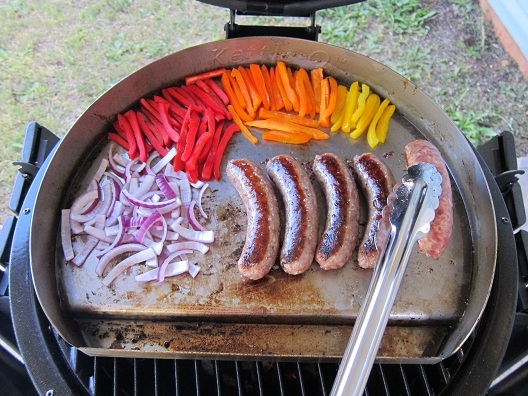 The Kettle-Q did an excellent job of cooking the brats, onions and peppers. 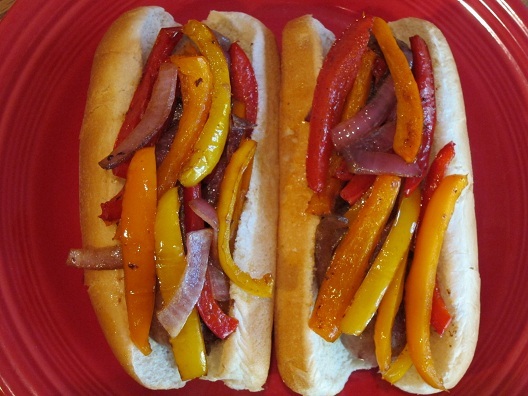 It all tasted like something you would find at your favorite ballpark. After dinner I went back outside and cleaned the Kettle-Q. I used the flexible 4 in. wide stainless steel scraper to clean it with. I was really happy with how easy the Kettle-Q was to cleanup and it only took me a minute or two to do so. I just used the scraper, but you can also use the high temp scrubber if you have any stubborn spots. I was extremely impressed with how well the Kettle-Q worked. I also like the fact that I can use it on my other grills and smoker, like my Weber Performer, Weber One Touch Gold and my Weber Smokey Mountain. 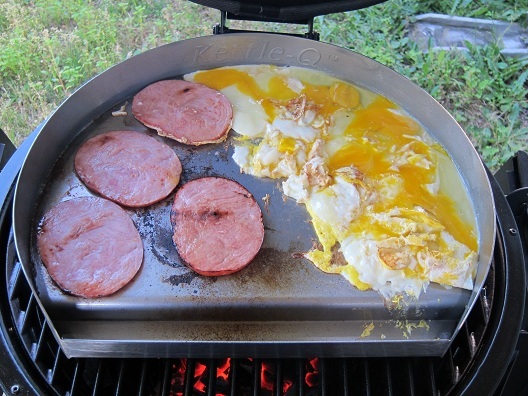 The Kettle-Q is a very high quality griddle that’s worth the price and I know that as long as I take care of it, I will get many years of great use out of it. You can find a great deal on the Kettle-Q here . For more information on the Kettle-Q please visit their Facebook & Twitter pages as well as their Website. Make sure to check back next week for another great BBQ Tools & Tech Review! Great review, as usual. The breakfast looks awesome! Thanks Mark! I’m loving the Kettle-Q. It’s like having my very own Waffle House griddle in my backyard 😉 Thanks for leaving a comment! This product is now on my short list of gotta-have stuff. I’m looking forward to this one! Thanks for leaving a comment John! 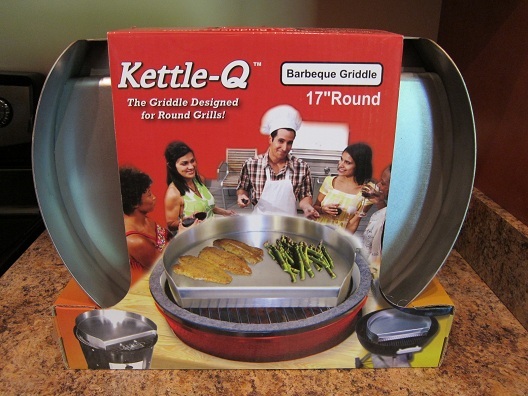 You’ll really love the Kettle-Q! Let me know what you think of it when you do end up getting one. 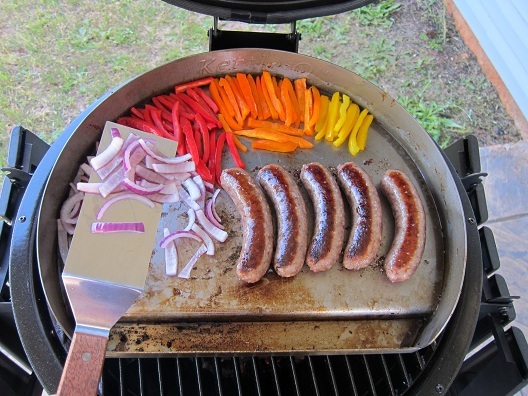 Great job Jay, a griddle on a grill is a great idea! Is it me, or does it look like Adam Sandler is on the box?? Thanks for leaving a comment bro! LOL it does look like Adam Sandler or should I say Happy Gilmore. Great review Jay! Thanks Kevin! I’m glad you liked the review. Thanks for leaving a comment. 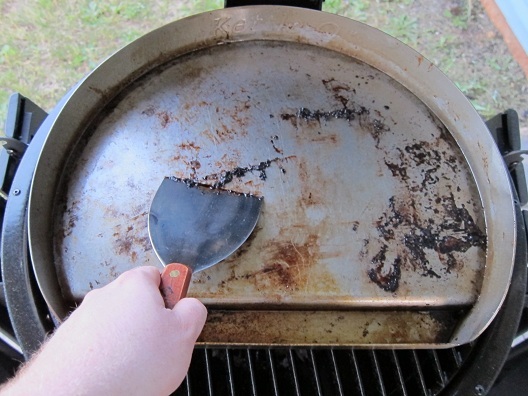 So…..have you used this on a gas grill yet? I don’t see much benefit in the kettle-q. Would make for something else to remove if one needs access to the charcoal. And there is this other thing that is driving my thoughts. The kettle-q cost twice as much as the sizzle-q. 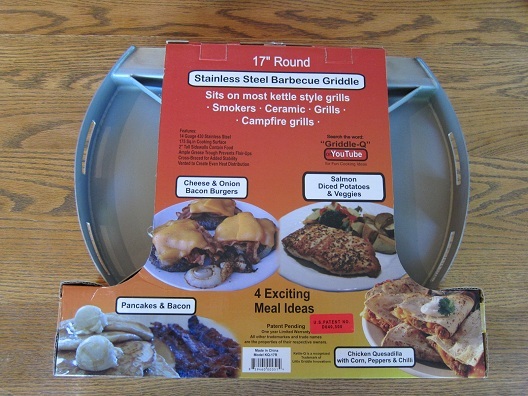 While the sizzle-q is cheaper I will never have the option of trying it on the Akorn due to the rectangular size. 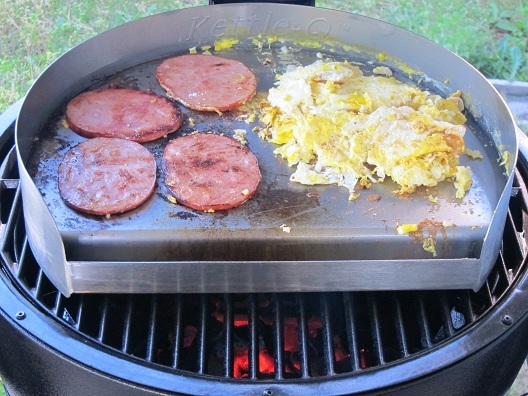 Remembered your review and wondered what thoughts you had about the best fire source for use of a griddle. Reviews | Best Barbecᥙe Sauces, Rubs, Tools <Loved it!